A subscription to fold3.com is necessary to access the soldiers' compiled service records. This site is not associated with fold3.com. Comer, Ephraim, Capt., 3rd La. Cav. Crump, R. H., b. 1846; d. 1878. Fischel, Leon served in the 15th Batt La Cavalry and was buried in the Anshe Chesed Cemetery. Gustofer, Jacob and Morris both served under Gen. Wirt Adams' Cavalry. They are buried in nearby Anshe Chesed Cemetery along with at least six other Confederate veterans. Their graves do not have markers. Holden, David, 10th Miss. Inf., 9th Miss. Inf, Co. E.
Hornthal, Louis, d. 1939, the last local veteran of the Lost Cause. He was buried in nearby Anshe Chesed Cemetery along with at least six other Confederate veterans. Kuhn, A. B. served in the 18th NC Inf. 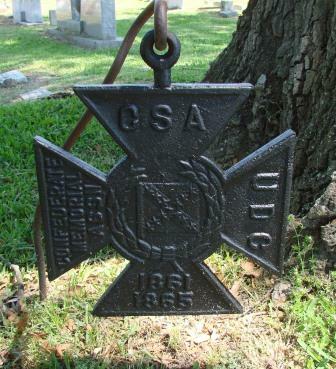 He was buried in nearby Anshe Chesed Cemetery along with at least six other Confederate veterans. His grave does not have a marker. Lowry, T. S., possibly 28th Miss. Cav, possibly 3rd Miss. Cav. Mackey, Samuel H., possibly 12th La Inf., Justice of the Peace in Warren County 1910. McMullen, John, Sgt., Swetts Btry; b. 18 Sep 1837; d. 10 Nov 1896. McSweeney, Patrick, d. 30 Jul 1894. On the bottom of his marker, on the edge of Soldiers' Rest, is written, "Erected by his friend Thomas Franey." Murch, Robert J., 36th Ga. Inf (Miss. Vols 1st Reg Cav) / 28th Miss. Cav. Purnell, William ("Mispah"), Miss. Partisan Ranters; Woods Reg. Cav; 1st Miss. Cav. Wirt Adams Reg. Sartorius, Philip was the first citizen wounded in the Vicksburg campaign. He signed on with the 15th Batt La Calvary. He was the last local veteran of the Lost Cause. He was buried in the nearby Anshe Chesed Cemetery with six other veterans. His grave has no marker. Speyerer, George, d. Feb 21, 1931; Miles' Legion, Co. A, Miles' Artillery. Teller, Emanuel served with the 18 NC Inf. He is buried in the nearby Anshe Chesed Cemetery. His grave has no marker. Thompson, Thomas J., b. 1848, Miss. ; d. 1937; “Adams Miss. Regt.” on his grave marker; 1st Miss. Cav., Co. E., Wirt Adams, then Wood’s Regiment. Vandenburg, D. C., Asst. Steward, Hospital Dept.